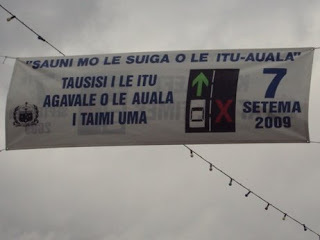 I heard about the road switch within an hour of arriving in Samoa. On an impromptu walking tour of Apia led by Laura and Todd, Todd mentioned as we crossed a street that Samoa planned to switch from driving on the right side to driving on the left. As the switch date, September 7, has drawn closer, it has become quite the topic of conversation, and the most heated political issue on the islands. And now that the date is 6 weeks from tomorrow, the countdown has begun. The government’s reasons for the switch are somewhat unclear. Since Samoa falls under New Zealand’s sphere of influence and quite a bit of tourists are Kiwi or Australian by nationality, the road switch might be to encourage more tourism. There’s also an argument about the road switch justifying the retrofitting of Samoa’s roads, some of which sorely need to be repaved. Part of the issue is the side of the road you drive on dictates which side of the car is better for the driver. If the driver sits on the side of the car opposite to the side of the street the car is on, it is easier to see oncoming traffic. This helps with passing. 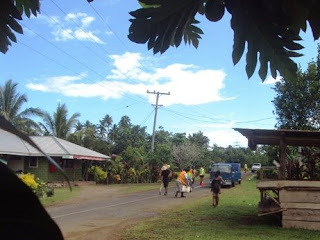 And since many of the roads in Samoa are one lane in each direction (or one lane for both directions), passing into oncoming traffic is extremely common here. So another reason may be making the roads safer for right-hand drive cars. 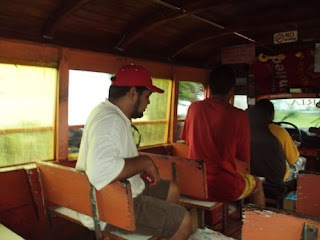 All of the buses in Samoa are left-hand drive, so a common sub-topic of conversation is theorizing about how buses will be changed. A frequent rumor says that the government will subsidize bus drivers to re-model a bus to put the driver on the right and cut a hole on the left for the door. More likely is that the driver will stay on the left and a door will be cut so passengers will board and disembark behind the driver. As it stands today, there are many right-hand drive cars in country and many left-hand drive cars. 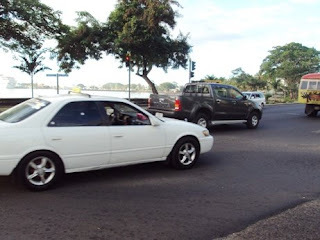 When my parents and I were getting into a taxi at the wharf, the driver was loading the bags in the trunk, and when I went to get in the front seat, it turned out I opened the driver-side door. “Are you driving?” The driver asked. Ha. No. 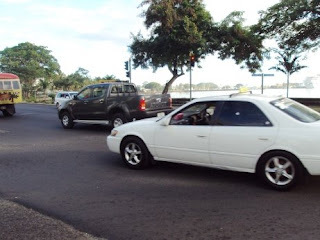 TV stations have started showing commercials that demonstrate how to approach and maneuver tricking driving situations from the opposite side of the road—like roundabouts, which constitute a handful of Apia’s main intersections. At poker night, Joey 81 was talking about certain intersections which are far more right-side drive specific. Certain intersections have wedge islands specifically for making right turns. How’s that going to work? Since we don’t drive, Peace Corps are mostly affected only as passengers—with the major exceptions of a.) being pedestrians and crossing streets and b.) riding bicycles. Visiting Auckland, Luisa and I had a helluva time figuring out where the cars were coming from. But I guess that’s the kind of thing you get used to after a while. Riding a bike is going to be more of a challenge, and I think I’ll stay off for the first couple weeks. Maybe the Peace Corps will have a training session. 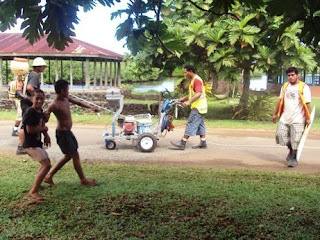 Road crew painting dividing lines down the center of the street in Fausaga. Another of the road crew. Buses will have to remove the seat where the kid in the red t-shirt is sitting and cut a hole for a door on the left side of the bus. Artist's rendition of Apia after road switch. That Prime Minister is stupid by deciding to switch the side they drive on. Must be under the table shennigans!! !